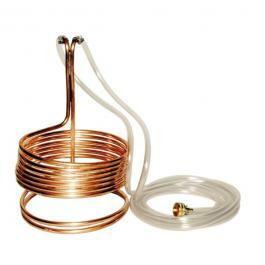 Home :: Equipment & Supplies :: Funnels, Filters, & Straining Bags :: Mashing and Sparging Equipment :: Copper Immersion Wort Chiller 25 ft.
Made from 25 feet of 3/8" copper tubing. 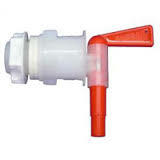 Includes vinyl tubing for cold water in and warm water out, and a female garden hose thread fitting that will fasten to most utility sinks. Approximate dimensions: 6-7" to the top of the coils, 9.5" in diameter, 15.5" to the top of the chiller. Some slight deformation may occur in shipping, but the soft copper tubing can be easily bent back to these specifications.